LabCorp’s Covance Drug Development business will be the first global contract research organization to offer services on Mission Bio’s Tapestri Platform for single-cell DNA genomics, the companies said, through a collaboration whose value was not disclosed. Those services are designed to support biopharmaceutical customers as they pursue faster, more precise clinical trials. LabCorp is also evaluating the Tapestri Platform for applications in clinical diagnostics and in the development of new companion diagnostics. “There is keen interest in improving the identification of residual cancer cells that remain after treatment, to provide more specific information about treatment response and remission durability,” Steve Anderson, Ph.D., chief scientific officer of Covance, said yesterday in a statement. “A more sensitive test for minimal residual disease, which is possible through single-cell genomics, has great potential to streamline clinical trials and help providers manage their patients’ care more effectively. Mission Bio CEO Charlie Silver added that his company has seen “significant interest” from global pharma companies seeking to access the Tapestri Platform to support their clinical programs. Tapestri is also designed to detect gene editing with the precision of single-cell resolution given its ability to identify mutation co-occurrence across distinct cell populations. By providing such insight into the consequences of gene editing experiments, the platform has generated special interest among drug developers applying CRISPR and other gene editing technologies, according to the company. 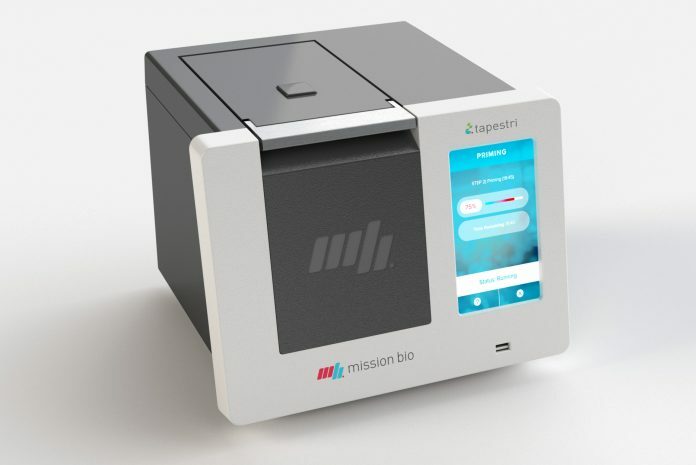 The collaboration comes more than three months after LabCorp joined Agilent Technologies and other investors in Mission Bio’s $30 million Series B funding round, completed in December 2018. At the time, the company said that proceeds from the financing would be used to expand and further develop Tapestri for oncology; broaden the scope of its activity into CRISPR and other gene editing applications; and expand overseas. Mission Bio also announced an alliance with Argonaut Manufacturing Services, a cGMP contract manufacturing organization (CMO) serving the biopharmaceutical and human diagnostics industries, to serve as its preferred global CMO. By adding Argonaut’s expertise in operations and manufacturing, Mission Bio said, it can provide customers with an end-to-end solution for its biopharmaceutical business, as well as enable turnkey commercialization of its Tapestri Platform. The value of the Argonaut partnership was also not disclosed.